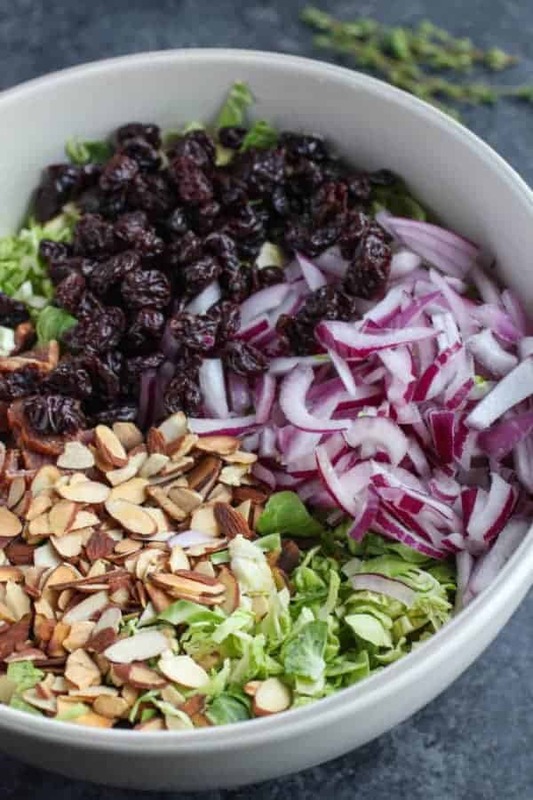 Shredded Brussels sprouts are a hearty stand in for lettuce in this delicious salad that’s studded with toasted almonds, tart dried cherries and smoky bacon. You may have already come to the conclusion that we’re quite fans of Brussels Sprouts. We’ve shared several recipes that call for this hearty, high-fiber, versatile veggie including Brussels Sprouts Sweet Potato Sausage Hash, Roasted Brussels Sprouts with Bacon, Sweet Potato Unstuffing, and Brussels Sprouts with Apples and Blue Cheese. So if you’re a lover of Brussels like we are, be sure to check out those recipes too. And if you’re not, well we suggest you give the recipes a try anyways because you may discover a newfound love for Brussels! Today, we’re mixing it up a little and instead of sharing a cooked Brussels sprouts recipe, we’re keeping them in their raw state and shredding them to use as a hearty stand in for lettuce. PS: You can also use shredded cabbage or even broccoli slaw. 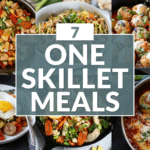 This recipe makes a large batch so you can either make half of the recipe or make the full recipe and enjoy the leftovers in the days to come. This salad will keep well in an air-tight container in the fridge for up to 4-5 days. Add some chopped chicken and you’ll have yourself a delicious and well-balanced lunch. 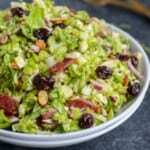 Brussels Sprouts Salad with Citrus Vinaigrette – a crowd-pleasing addition to your real food table. 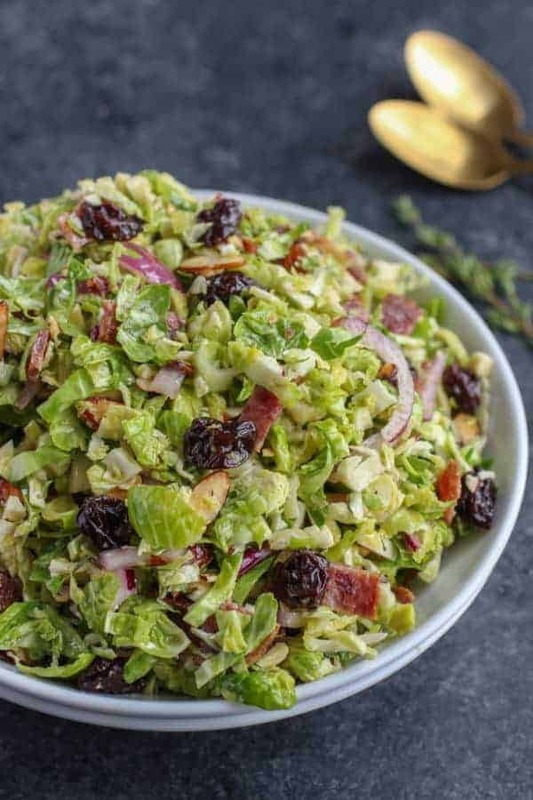 It’s quick to make (if purchasing pre-shredded Brussels sprouts which we recommend), it’s healthy, it’s full of flavor, and ALL of the ingredients can be prepped a day or even two days before it’s on the menu. 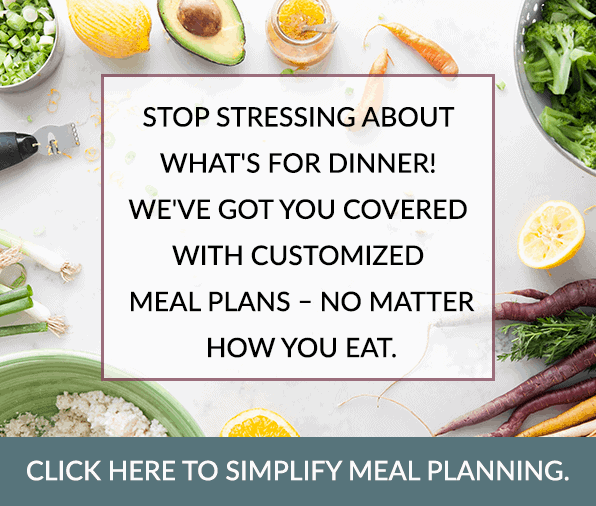 We love prep ahead recipes! Quick Tip: If using whole Brussels we recommend using a food processor with the shredding blade OR thinly slicing them with a knife (you’ll get a little arm workout with this method). This salad is a great addition to a holiday meal or weeknight dinner. You’re going to love the flavor combination of the citrus vinaigrette with the smoky bacon (because bacon! ), red onions, tart cherries, and toasted almonds. Deliciousness with every bite! Citrus Vinaigrette – a go-to salad dressing and marinade. 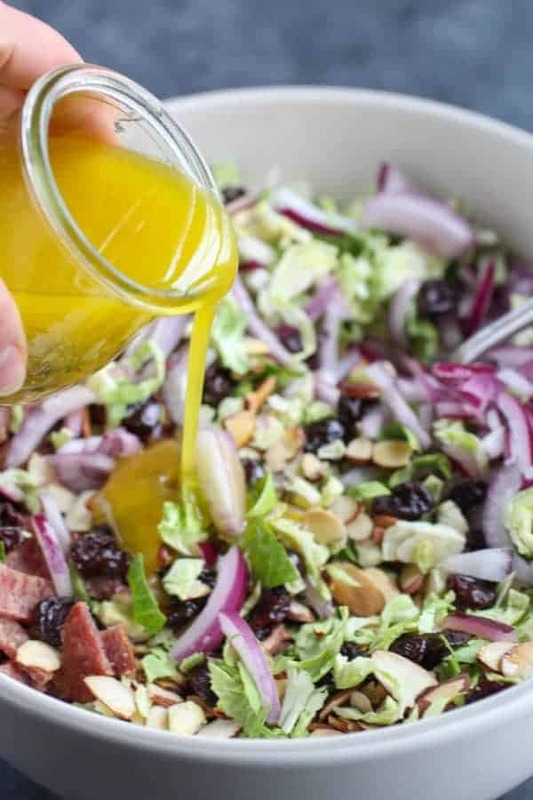 Citrus vinaigrette not only adds amazing flavor to this Brussels Sprouts Salad but it’s also quite versatile and can added to any salad and also makes for a tasty meat marinade. 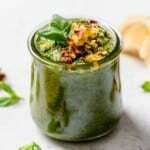 Make this vinaigrette during your weekend meal prep and enjoy on salads or as a marinade for meat throughout the week. So good! We make citrus vinaigrette with fresh orange and lemon juice, shallots (or garlic), yellow mustard, fresh herbs and our favorite Primal Kitchen Avocado Oil (may use olive oil). The Primal Kitchen Honey Mustard Salad Vinaigrette can be used as a tasty alternative for the Citrus Vinaigrette if you prefer to use a pre-made dressing. Note: Primal Kitchen Honey Mustard Vinaigrette is not Whole30-friendly but the Citrus Vinaigrette is! Brussels Sprouts Salad + goat cheese = OMG! If you’re feeling real fancy! Add 4 oz. of crumbled goat cheese to this recipe. We love the distinct flavor, slightly tang and creaminess that goat cheese adds to this salad. But if goat cheese isn’t your thing, you could also try shaved parmesan. We hope you enjoy our Brussels Sprouts Salad with Citrus Vinaigrette as much as we do! Shred Bussels sprouts using the shredding blade of a food processor or slice thinly with a knife. 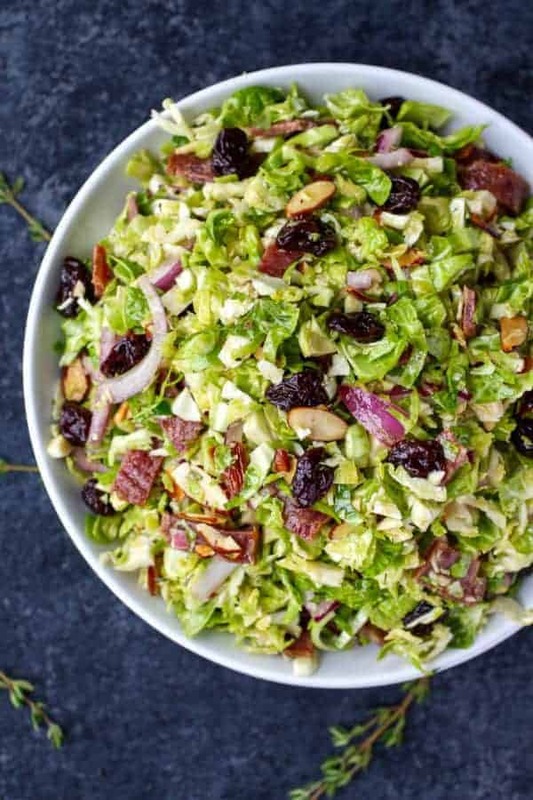 Place Brussels sprouts in a large bowl and combine with chopped bacon, red onion, cherries, almonds and optional goat cheese. Add vinaigrette immediately before serving and toss well to coat. Comment below and let us know what’s your favorite way to prepare Brussels! I’m in the middle of Whole30 and am bringing this salad to a potluck tomorrow. I haven’t put it all together yet but I just wanted to comment and say that the dressing is AMAZING! I can’t wait to try the finished product. Thank you! That’s great to hear! Way to BYOS so you know there will be something you can enjoy at the potluck. Can I use a spicy brown mustard instead of yellow? Hi Katie! Yes, absolutely. Enjoy! Made a big batch with finely chopped cabbage. Left the almonds out. Was awesome!!! With the bacon in there, it’s a meal on its own! Currently making this! Excited to try it! I am wondering if when storing it the dressing should be stored separated and added when served. Thank you! We love when we find people who get just as excited about this salad as we do! 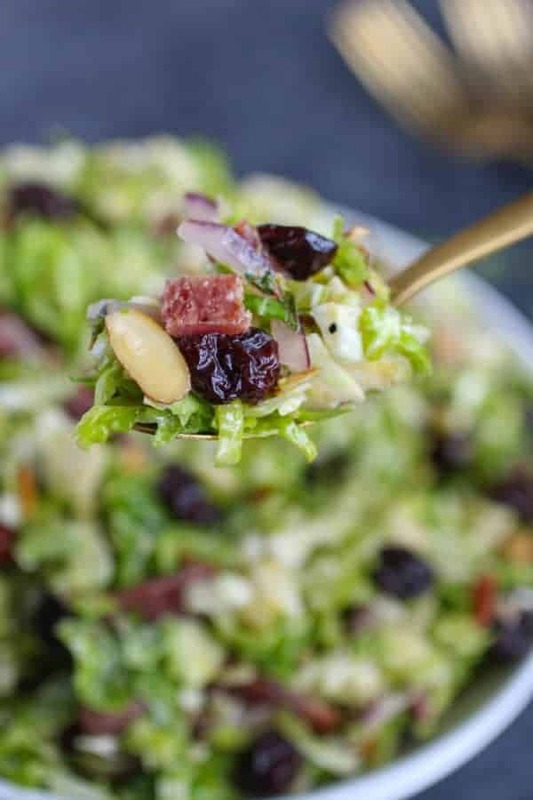 You can do it both ways – adding the dressing just before serving means the bacon and nuts will be crispier but it is hearty enough to stand up to the dressing in the fridge for a few days. Is there a vegetarian substitute for the bacon or just omit it? 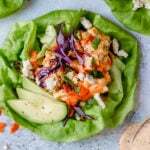 You could use a vegan bacon substitute such as tempeh bacon or coconut bacon – or you could substitute smoked almonds for the regular almonds for a little smokey flavor. Thank you. I like the smoked almond suggestion???? I made this salad twice, once just a single bowl and really just an approximation to see if it worked anD even that approximation was very good. So next day it was my turn to cook for friends and this was the salad. I was pretty quiet about how much I liked it and left it up to the table. It was a hit, the common remark was that every bite seemed to have a little taste surprise and the citrus dressing set it all off. I didn’t have an orange but did have a few manderines and they added their own taste. My wife has already scheduled this for our family gathering which is more potluck and it will be a winner. Only remark I have is like most salads, what little we had left the next day was not the same. Thanks for your kind words! I’m so happy to hear you and your guests loved the salad – I always find that it’s a hit at parties because, like you said, every bite is just a bit different. Sooooo good! How many days do you think the dressing can last in the fridge?! I’m thinking of making one giant batch and serve now through next week. The dressing will last at least a week in the fridge. Yay!! Thank you!! Happy Thanksgiving!!???????? You’re so welcome. Happy Thanksgiving to you! Just made this for tomorrow – can’t wait for my friends to try it! Most slaws are better the next day – should I really wait to dress it? 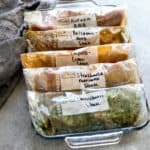 You could dress it the day before but I would leave out the dried fruit, bacon and nuts and add them the next day to keep them from getting soggy. I can’t eat goat cheese. What would be best to substitute with? Hi Teresa, feta cheese also works really well in this recipe. 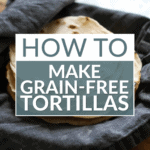 Or you could simply omit the cheese if you wish. I’d appreciate knowing if the “Nutritional Information” provided includes the addition of the salad dressing, which is always hefty in calories. My query is based on recently having started “The Mayo Clinic Diet” in order to lose weight gained while on a drug in 2016-17. Would love to fold this recipe into my plan, but do need to know about my query above. If the salad dressing is in addition to the nutritional information provided, will need to spray on balsamic vinegar instead. Many thanks in advance. Yes, the nutrition information includes the dressing. 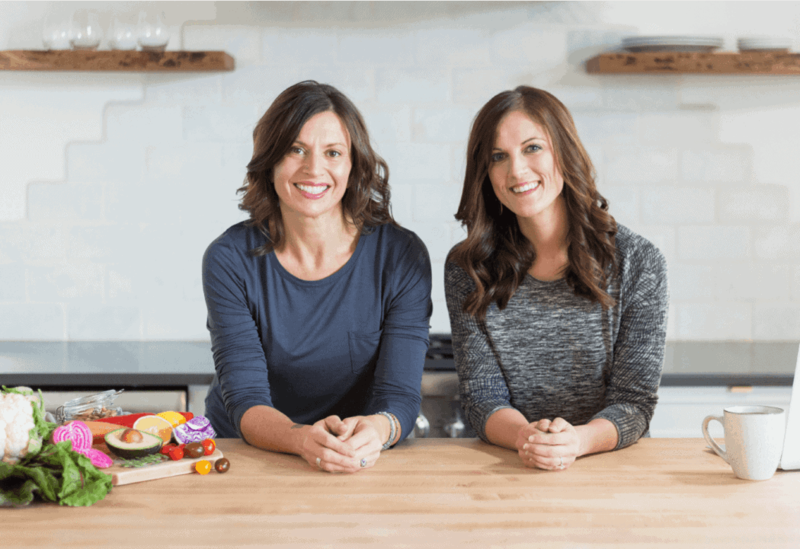 All of our recipes will indicate if something is not included because we understand how important this is to some who are looking to modify their diet. How do you make the citrus vinaigrette dressing? The ingredients and directions are in the recipe. Perfect addition to my salad recipe collection! Delicious!! Can I sub EVOO or should this be regular olive oil? I had this last Thanksgiving at a friend’s, loved it so I made for family for Easter. I actually like it better the next day, just added everything but the dressing right before I ate it. I agree. This salad is better the next day when everything has had a chance to mingle – though the nuts aren’t as crunchy so you could always wait to add those just before serving. What is the sat fat? I am on weight watchers and need that balue to calculate points. 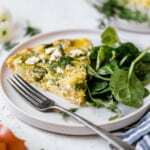 You can calculate the saturated fat by plugging the recipe into a free online calculator like the one at MyFitnessPal.com (Click Food >> Recipes to find the place where you can add recipes vs. single ingredients). I’m sorry to hear that your dressing was watery. A small orange (about 2 1/2 inches in diameter) should yield roughly 3-4 Tbsp. juice depending on how juicy your orange is. As for the ‘tang’ some oranges are sweeter than others depending on time of year, growing season conditions, variety, etc. so if you feel the orange is too sweet you can replace some of the orange juice with lemon juice. Hope that helps! I just made this, and it is yummy. I usrd food Networks’ Orange Citrus Vinaigrette . this looks amazing, can this be made hours ahead of time, say in the AM? Thanks, Dianne! Yes, you can make the salad ahead of time. I’d wait until just before serving to add the bacon and nuts if you want them to be crispy though. Needed something to go with pulled pork sliders and this was an awesome accompaniment. I did not have any dried fruit on Hans so thinly sliced in a red apple. Delicious! A perfect accompaniment to pulled pork sliders! Glad you enjoyed this recipe! No vinegar in the citrus vinaigrette? The juices from the citrus fruits stand in for the vinegar.